The computer mouse is an entire laptop computer in mouse form that uses the raspberry pi zero W as its brain. I originally wanted to just put a raspberry pi into a mouse but I soon discovered that that large of a mouse didn’t exist. Sure, your laptop may be considered an all-in-one computer, but if you’re not a fan of trackpads, you’ll still need a mouse to complete the experience. Electronic Grenade‘s Computer Mouse truly has everything — a mouse, a screen, a keyboard — and while the screen is tiny, it’s still enough to get started. 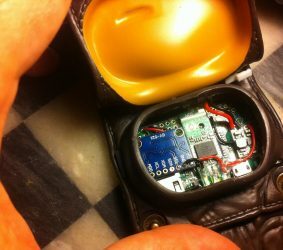 Electronic Grenade designed the device using Autodesk Fusion 360, housing a Raspberry Pi Zero W, the guts of two USB mice, a slideout Bluetooth keyboard, and a flip-up 1.5″ full-colour OLED display. For power, the mouse also plays host to a 500mAh battery, charged by an Adafruit Micro-LiPo charger. It’s very cool. Very, very cool. 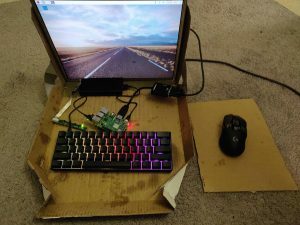 From cardboard pizza boxes to ornate, wooden creations, our community members love making Raspberry Pi laptops out of whatever they can get their hands on. Variations on a theme include projects such as Jeremy Lee’s wrist computer with onboard gyromouse, perfect for any Captain Jack cosplay; and Scripto, the Raspberry Pi word processor that processes words and nothing more. If you’re a fan of retrofit Raspberry Pi projects, check out Electronic Grenade’s Xbox controller hack. And while you’re skimming through their YouTube channel (as you should), be sure to subscribe, and watch the videos of their other Raspberry Pi–based projects, such as this wooden Raspberry Pi 3 laptop. You can also help Electronic Grenade design and build more projects such as the Computer Mouse by supporting them on Patreon. A turducken is a chicken stuffed into a duck, that is then in turn stuffed into a turkey, and it sounds all kinds of wrong. Do you know what doesn’t sound all kinds of wrong? Electronic Grenade’s Computer Mouse. The ‘cool, cool, cool’ GIF is from the movie Storks. If you haven’t watched Storks yet, you really should: it’s very underrated and quite wonderful. I meant this Captain Jack and not this Captain Jack. I’m really glad you specified which captain jack lol. Carpal Tunnel, that would be a great use. The ergonomics of it make me cringe. It seems more like a “because I could” kind of project, though. You could always ssh into it, though. Which leads me into the recent SSH issue. Is that a problem for Raspbian? It is NOT an SSH problem, you should avoid using scp and use sftp instead (also part of OpenSSH) or rsync (even better). Excellent ‘proof of concept’ but just like your local supermarkets el cheapo products, the bare minimum to qualify as what it claims to be. Not really functional. Increasing the screen size to 3-4 inches would make it usable. Change the mouse to a trackball, much more suitable and sensible. Make the keyboard removable so it can be positioned correctly. I wonder where did you put the optical tracking part of the mouse, as there doesn’t seem place for it, underneath. Also, I would have made the keyboard hinged out, so that it could turn 90 degrees, and could be used “horizontally” instead of vertically. or make it detachable (with bluetooth). 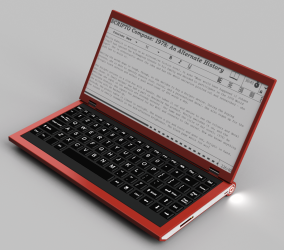 otherwise it seems a nice idea, but now not really practical..
Steampunk laptop powered by Pi: OMG so fancy! 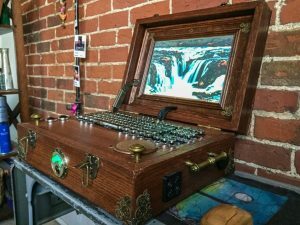 A stunning steampunk laptop: brass goggles are optional!